Click here to tell us why you like water soluble oil paints and share one tip or two with us! Water soluble oil paints are a great alternative if you love to paint in oil but have had problems with the turpentine or mineral spirits used with traditional oils. Or maybe their reputation for toxicity has kept you from trying oil painting at all. Now you can use what I call a modern artistic miracle—water soluble (or mixable) oil paints. Not only do they rival traditional oil colors in terms of their quality and the finished look, but they are even more convenient because they clean up with soap and warm water. Not only you will you not have to deal with toxic turpentine or other solvents, but you also don't have to sacrifice the quality of your paintings to use water soluble oil paints. I first came in contact with water soluble oil paint a number of years ago. I saw them advertized in an art catalog and ordered them out of curiosity. At first, I stuck to the Winsor & Newton Artisan water mixable oil colors, but I have since then bought Duo Aqua Oils (made in Japan at Holbein Color Works), Van Gogh H2Oil (made by Royal Talens) and Lucas Water Soluble Oil Paints from Germany. Now Holbein also has produced a line of water soluble oil paints as well. What is a water soluble oil paint color? In recent decades, brilliant chemists have successfully altered the chemical structure of traditional oils and made them able to bind with water (you know that water and oil normally do not mix). With this revolutionary change, not only you can clean the paints from your brushes with plain water, you also can use water as a traditional solvent to thin the paints. Use these oil paints just the way you would with traditional oil colors. They have basically the same drying time and you can use the same texture effects. It amazes me that despite the change in their chemical structure, they still behave like traditional oil paints do. Can you mix water soluble oil paints with traditional oil colors? Yes, you can. However, the water soluble oil paints can not exceed 30% in the mix, otherwise they convert to traditional oil paints and you would still have to use turpentine to work with the mix. While you can clean them with turpentine, it defeats the purpose of using these paints! When in doubt about the ratio because you are not sure exactly how much is too much, I suggest that you clean your brushes with turpentine just to ensure the oil paint does not get stuck in the brushes and ruin them. Are there any mediums made for water soluble oil paints? Yes, there are mediums made just for the purpose. The choice might not be as varied as those made for traditional oil paints. 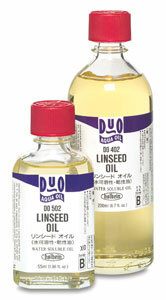 I use this particular water mixable oil painting medium. It is somewhat tacky and sticky. It makes the color flow well and is transparent. I can blend it into all the tube colors laid out on the palette. Then I don't need to use varnish when the painting is done, because it gives an even gloss to the canvas. I can also add a little water to dilute it if it is too thick. Some caveats to watch out for: water soluble oil paints seem harder to clean off the oil brushes than with turpentine. Remove the oil paints by wiping them off with paper towels first and dip them into the water. Good thing that water is cheap because sometimes you need a lot of water to clean the brushes and oil paints. Also I notice that a sediment of oil paint tends to form on the walls and the bottom of the water jar. If this happens, remember to scrub the leftover paint off with tepid water and a detergent. Despite that minor nuisance I think that water soluble oil paints are great because they clean up with water, save you from from the potential assault of harmful solvents, and are ideal for traveling overseas. I can also paint indoors with the windows closed without worrying about inhaling the fumes of turpentine and mineral spirits. I have taken them overseas several times and do not have to look for art supply stores to hunt turpentine! When the painting is thoroughly dried, varnish it the way you would varnish a regular oil painting. The color choices might not be as plentiful as you see in the traditional oil paints. You can, however, add one or two of your favorite traditional oil color into your water soluble oil paint. Remember the 30% rule stated above. You should have not any problem then. Have A Tip or Two for Using Water Soluble Oil Paints? Or Do you Simply Love Them? What is your experience of using water soluble oil paints? Share your tips if you have any! How I clean brushes when using H2O soluble oil paints. Come and get the Right tools to boost your drawing skills here!